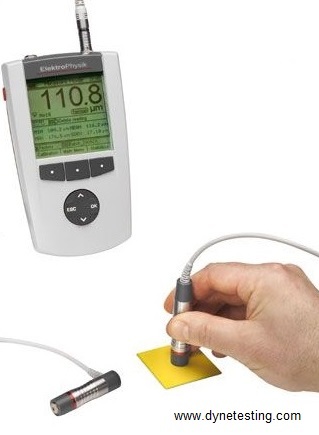 The MiniTest 7400 is a high end dry film coating thickness gauge with a wide range of external interchangeable probes and memory for up to 250,000 measurement values and 500 measurement groups. The instrument enables the user to take a wide range of measurements, from the thinnest coatings in the sub-micrometer range (e.g. galvanised coatings), difficult geometries of the objects to be measured (e.g. measurement of steel pins, measurement to be taken in recesses and holes, etc.) down to thick coatings (e.g. flame retardant coatings in steel constructions, rubber coatings etc.). The probes (sensors) supplied with the instrument are extremely accurate and reproducing results on account of their manufacturing process. Despite high accuracy the sensors are wear resistant and withstand even years of use on rough surfaces. Each sensor is subject to a fully automatic factory test and provided with 50 calibration points for correction of even the slightest deviations. Each sensor is encoded with temperature compensation for automatic correction of the effect of temperature on the readings. With preset measuring units µm or mils. Please specify while placing the order. Various probes are available depending on your application. Please speak to our sales team to discuss your requirements.